Since its inception in 1938 and incorporation in 1952, SEPCO has emerged as a leading manufacturer in the electrical distribution industry. Built on the foundation of quality products and personalized customer interaction, SEPCO delivers unparalleled service and knowledge to meet and surpass each customer’s expectations. Morris (Pop) Reddock founded SEPCO with his son Philip in 1938 selling metal fabricating and stamping parts out of a garage. Phil was the office “front man,” while Morris liked to go on the road to do business and see customers, and to pick up new ones along the way. He would go to customers and not necessarily ask them what they needed, so much as tell them what they needed to purchase for their stock. You could always recognize Morris by his signature bow-tie, loafers and half-smoked cigar. He was a mere 5′ 1″ tall but people saw him as a giant in the business field at that time. Morris, who everyone called ‘Pop’ or ‘MD’, passed away in 1969. He left a strong and continuing policy at SEPCO of superior customer service, excellent delivery, and a legacy that endured today through his son Phil’s Son-in-Law Howard, and Howard’s son Ross. SEPCO was incorporated and carried a product line which included EMT and rigid, one-hole and two-hole pipe straps, reducing washers and switch box supports. SEPCO moved to 6301 New Utrecht Ave which is still their current location today. Howard Feldsher joined the company. Philip Reddock retires after 50 years and Howard Feldsher becomes President and Owner of SEPCO. Ross Feldsher joined SEPCO to become the 4th generation to work for SEPCO. Ross Feldsher named Vice-President of Operations. SEPCO Hot Dipped Galvanized Moguls were introduced and approved by many municipalities and agencies such as New York City Transit Authority (NYCTA), Department of Transit (DOT), Port Authority of New York & New Jersey (PANYNJ), and Department of Environmental Protection (DEP). Robert Miles retires after 52 years and 4 generations of employment. SEPCO was featured in Crain’s Magazine for many of their products which were installed on high profile jobs such as World Trade Center- Freedom Tower, World Trade Center Memorial, and was a huge part in the Build It Back NY- Hurricane Sandy Relief Program. 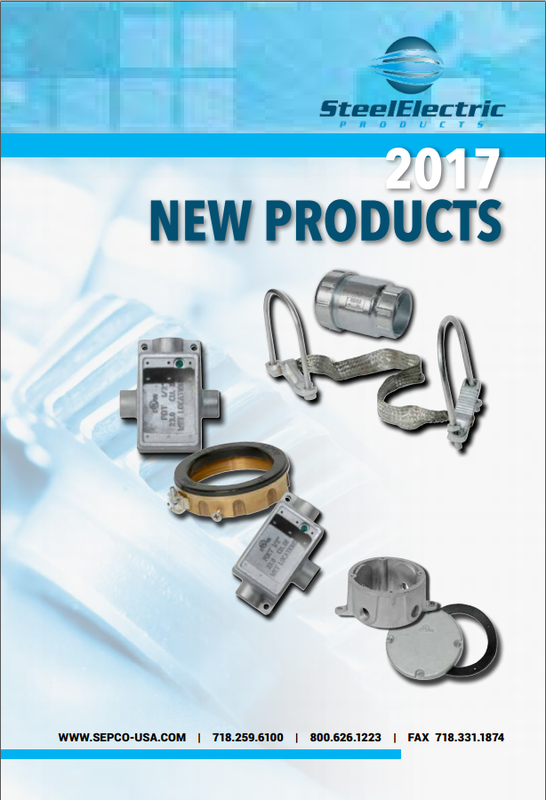 SEPCO introduces a full product line of Hot Dipped Galvanized items which includes MIGB’s (with aluminum lugs or copper lugs), CHM Hubs, Conduit Bodies, Moguls (styles C, LB, LL LR & T), and Three Piece Couplings. SEPCO also introduces Mechanical Galvanized Liquidtight Connectors (straights, 90°’s, & 45°’s) with or without copper lugs.